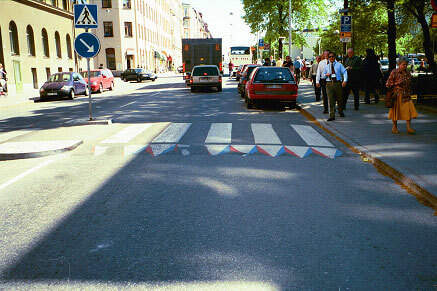 A virtual raised crosswalk in Sweden. At one time or another we are all "pedestrians" or "drivers" or "bikers" or "passengers." And we most likely at one time or another have either been stuck in city traffic and blocked a crosswalk because we couldn't make it completely through the intersection. And we also have probably been on the other side as a pedestrian trying to cross the street only to have a vehicle blocking our way. It is an awkward and frustrating experience for both the driver and the pedestrians. But what to do about it? Well, as in a lot of other innovative ideas, the answer could come from across the pond. Many European cities have been experimenting with traffic calming measures including raised pedestrian crosswalks. 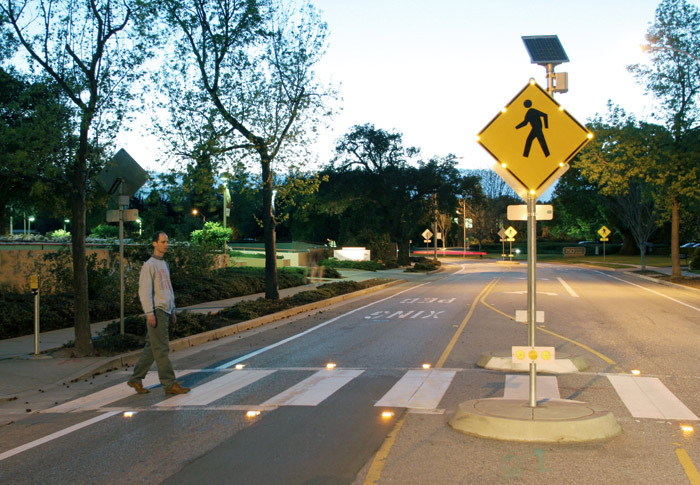 Raised crossings slow down motor vehicle traffic and increase pedestrian visibility. Another idea being implemented in some places is LED lighting, or in-pavement lighting (pictured below). When pedestrians are walking across the street the pavement lights turn on, adding an extra visible warning to drivers that pedestrians are about to cross the street. Raised pedestrian crosswalks, in-pavement lighting and other safety measures when implemented will make it easier for both pedestrians and drivers and hopefully reduce the annoying circumstances of cars blocking crosswalks in rush hour traffic.